It is amazing what you can find when moving artwork in New York! There are so many talented artists, beautiful outdoor installations, creative street art masterpieces, and many other incredible things related to the fascinating world of art! At Fine Art Shippers, we enjoy moving artwork in New York, especially when we are lucky enough to meet some great people and no less great pieces of art. 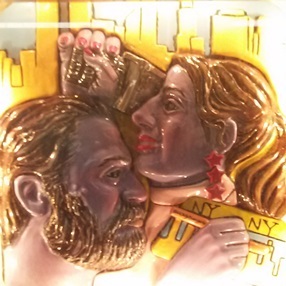 In this blog post, we want to tell you about one of the best New York-based artists and her fantastic ceramic masterpieces that can be found in the subway station. As professional art shippers specializing in moving artwork in New York City and worldwide, we pay attention to literally everything in one way or another connected with art, even when we are not actually at work. You should simply look around, and you will find truly incredible things that have always been right before your eyes. For example, have you ever seen a fantastic art installation in the 42nd Street Times Square subway station? If not, you should do it at the first opportunity! 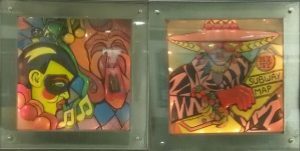 This beautiful installation represents a collection of colorful, offbeat ceramic relief sculptures by Toby Buonagurio, commissioned by MTA Arts and Design. Consisting of 35 unique pieces that are all available for public view 24/7, it is truly amazing and definitely worth seeing with your own eyes! 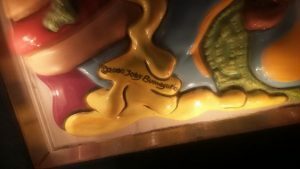 Toby Buonagurio is a reputable American artist who additionally teaches art at Stony Brook University, which is part of the State University of New York system. Her beautiful ceramic sculptures inspired by Pop Culture and extensive international travel are exhibited in many art galleries and museums throughout the United States and Japan. So it is really amazing when works by such a great artist can be viewed by subway riders daily. Moreover, they are so totally New York, filled with a multicultural vibe of this unique city, that it is simply impossible not to stop and look at every one of them! It is needless to say that Fine Art Shippers can safely move ceramic art of any kind, even such delicate and valuable pieces as Toby Buonagurio’s relief sculptures. Moreover, while moving artwork in New York is our specialty, we can also ship ceramic, porcelain, and other extremely fragile items safely and securely to literally anywhere in the world. You can call us with any art or antique moving problem you have!